Here’s my 2015 genealogy resolutions to take me through my family history research over the next 12 months. What will yours be? For a couple of years now, I’ve been setting myself some ‘Genealogy Resolutions’ – some to-dos, tasks, brick walls – all challenges for me to try to solve in the following 12 months. 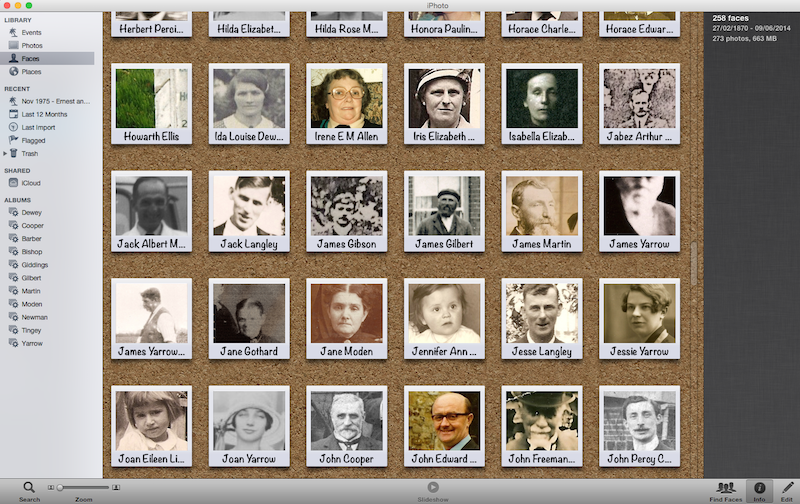 My iPhoto is already home to 258 relative faces. I just about managed to get a few more photographs in 2014, but not the specific ones I wanted – namely of my great grandmother’s Gilbert family, and in particular of her wedding in 1909. I didn’t even get round to writing to that part of the family to ask them if they had copies of the images. So, in 2015, this will be my first mission. Also, my father’s oldest brother has contact with his aunt still, and this connection had previously given me access to a wide range of beautiful Victorian and Edwardian Martin family photographs. Back in 1995 when I first saw these images, I had to pick and choose which photographs to borrow, have sent away to have negatives made for, and then printed. Scanners were not cheap or readily available for home use. But now… there should be no stopping me making high resolution scans of all of the images I can lay my hands on. For those who have been reading a while, you might have seen me refer to an ‘evil’ gtxX grandmother Mary Bailey (née Clarke) who just seems to have dodged dying for a long time. After her stints in prison for child abuse, neglect, and cruelty of her step-children, and a few stints in the workhouse too, I have failed to find her death. One clue has arisen – leading me several miles off piste in Suffolk, that might pitch her as dying near Lowestoft in Oulton Union Workhouse. If that is the case, then she may now be buried beneath or amongst a housing estate. I’ll order the certificate, and if that fails, I may well be calling upon the paid services of a researcher to hunt this ancestor down. I’m determined to kill off Mary. A few days ago I wrote about feeling overwhelmed by the vast avalanche of records that are being made available – millions of new bits of data are out there, and it’s made me feel like I need to climb back down my family tree, and then learn to climb it again – looking for every new detail. 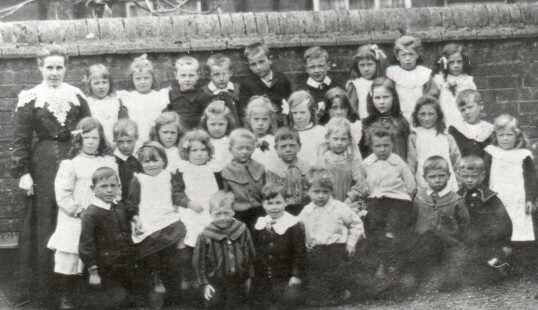 Mrs Alma Marchant with children from Wilburton Primary School, c.1904. My Great Grandmother Maude Yarrow is 5th from left, on the second row from the back. I aim to go back and explore School Records and Wills more in 2015 for relatives much closer, as well as continue my research in newspapers – which has given me some real delights through 2014. What would also be great, would be to find some records for Market Traders in Cambridge, Brewery Records for a pub that my ancestor ran in Ely in the 1890s, and Great Eastern Railways records detailing the tragic accident that killed my Martin ancestor in 1868. It’s been on my mind for ages now. Whilst some not-even-half-baked scrappy attempts at starting off some writing sits in various text editor programmes and apps, I’m not much further forward on the whole approach. Dorling Kindersley’s ‘Great Maps’ book takes their highly visual approach – something that appeals to me… but does it work for genealogy? Part of me wants it to be something very visual almost like a coffee table styled Dorling Kindersley visual encyclopaedia (as it was an old draw-out tree and a set of Victorian photographs that lured me into genealogy back in 1995), but part of me wants it to be more novelised so that I can flesh out context and livelihoods, whilst another part of me wants to write it as a more factual biography. I want my effort to be read, but also to be interesting to those who have a casual interest in genealogy and perhaps not in the specific families I’ve researched. Deciding the angle to the writing is more of a challenge than deciding what goes in it. 2014 led me to discover that a branch of the family that I had believed had remained in the village of Wicken, Cambridgeshire throughout their life, had actually shifted up to Lancashire to work in the cotton mills. This then led to the revelation that there were also two more wives, and two more children (at least) that I’d never known about. Simpson Bishop‘s story expanded considerably, and it’s not finished yet. Why was he living near, but separately, from his third wife Sarah Washington (née Brown) in 1871 and 1881? What became of him and his wife after 1881? Did they divorce? Did Simpson die up in Lancashire or did he return back to Wicken (or somewhere else) to end his days? A few more certificates and rummages should hopefully bring a conclusion to this surprise 2014 revelation. What are your Genealogy Resolutions for 2015? This is my third year of setting Genealogy Resolutions, and I find it quite fun to see whether I manage to solve these or even just progress them a little further each year. How about setting yourself some too? Leave your resolutions or links to your blogged/Google+’d resolutions in the comments below and let’s check back in 2016 to see how we got on. Nice! I like your ones about joining/re-joining societies – I think it’s probably about time that I rejoin the Newman Name Society. I joined right at the start of my research – so had very little information about my Grandmother’s family, and therefore received lots of information but lost interest because I couldn’t see any ties with mine. Now, I’ve got lots of information, so returning to their membership might be more useful to the both of us. Also, the one about your website overhaul – i’m nerdily enjoying overhauling my Family Tree UK site to include Schema meta-data for search engines to gobble up. I didn’t put that as a point as it changes with Google etc’s whim. Inspiring list. Thanks for sharing. To write more is my goal for 2015. I shed obligations in 2014, and with Wayne’s Journal ending in April 2015, I will be free to pursue my genealogical writing. I definitely think that learning to say ‘no’ is a key to being more productive, as it allows me to focus on things properly and do more doing and achieving, rather than taking on a lot and achieving very little. Good luck with your writing goal in 2015.